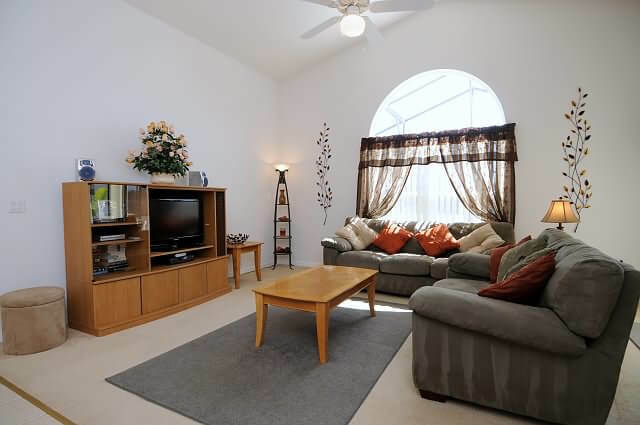 Master Bedroom with King size bed, en suite bathroom, walk in closet, cable television, ceiling fan, telephone, and sliding doors to the lanai. 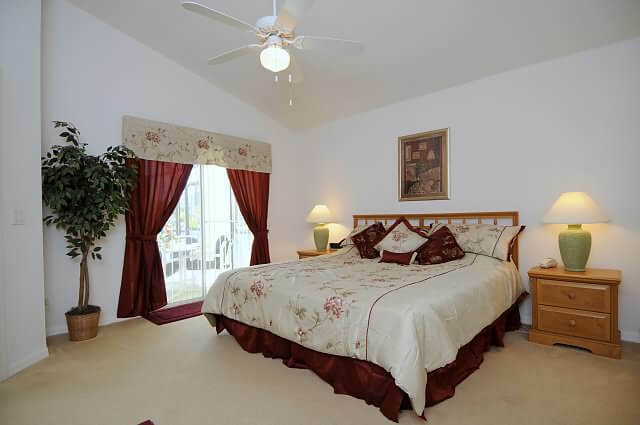 Second bedroom with double bed, cable television, ceiling fan. Third bedroom with twin beds, cable television, ceiling fan. Family room, cable TV, DVD player, Stereo, collection of DVD’s, books, and games. 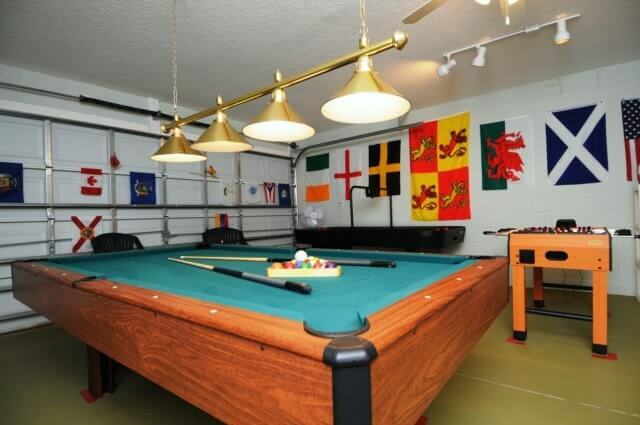 Games Room including pool table, foosball and air hockey table. Large private pool with Florida privacy glass, (heating optional), pool side furniture, pool shower, covered lanai with additonal ceiling fan. Located in the prestigious and sought after gated community of Cumbrian Lakes, “The Willows” is an immaculately presented 3 bedroom / 2 bathroom lakeside home of style and distinction. Surrounded by a myriad of breathtaking lakes, the entire area is a haven for local wildlife, flora and fauna. A charming nature trail encompasses the main lake, and is always a popular feature with guests, who often encounter the delights of cranes, osprey and blue heron on their leisurely daily stroll. Our stunning location is further enhanced by the natural beauty of community’s tree lined roads, lush manicured lawns and sympathetic landscaping, all of which evoke a restful feeling of inner peace and harmony. And yet, whilst you will undoubtedly delight in the rich bounty that nature affords, it’s also great to know that just a matter of minutes away, you can be at the very heart of Florida’s world famous theme parks and attractions. So you see, at The Willows, you really do get the best of both worlds ~ a perfect home in a prime location. With over 1800 sq feet of luxury living space, The Willows prides itself on being one of the largest 3 bedroomed vacation homes on Cumbrian Lakes. Tastefully and thoughtfully decorated throughout, you will instantly fall in love with its elegant appeal and realise for yourself what makes our home one of the most popular in the Disney area. Fully alarmed for both fire and intrusion, you can rest assured that your family and their possessions will remain safe and secure during your stay with us. The shimmering waters of our 28 x 13 south west facing pool reflect and echo the beauty of the neighbouring lake, which forms the stunning backdrop to our extended sun drenched decking. 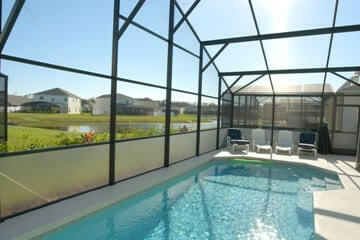 Fully screened and with the benefit of “Florida Glass” for additional privacy, there are ample sun loungers for those who enjoy basking in the glorious Florida sunshine. If you prefer the heat without the glare, our shaded lanai area complete with cooling ceiling fan and weatherproof table and chairs, is the perfect place to relax and unwind, or to indulge yourself with little al fresco dining. Attractive tropical planting just outside of the pool screen adds to the beauty of your vista, whilst the fully illuminated pool complete with emergency lighting ensures that you can extend your outdoor activities long into those temperate Florida evenings. For the safety of our younger guests, and in accordance with Florida State Law, a removable safety fence is fitted at poolside. Our extremely spacious Family Room is the ideal place to kick off your shoes and unwind at the end of a busy day of theme park hopping, golf or bargain hunting. Tasteful in its simplicity, this attractive room, with pool and lake views, features two large deep padded sofas, an entertainment console with matching side tables and coffee table, beautiful decorative lamps, cable TV, DVD player and a CD player. Immaculately presented throughout, the stylish window treatments and complimenting decorative accents add to the calming and serene ambience. 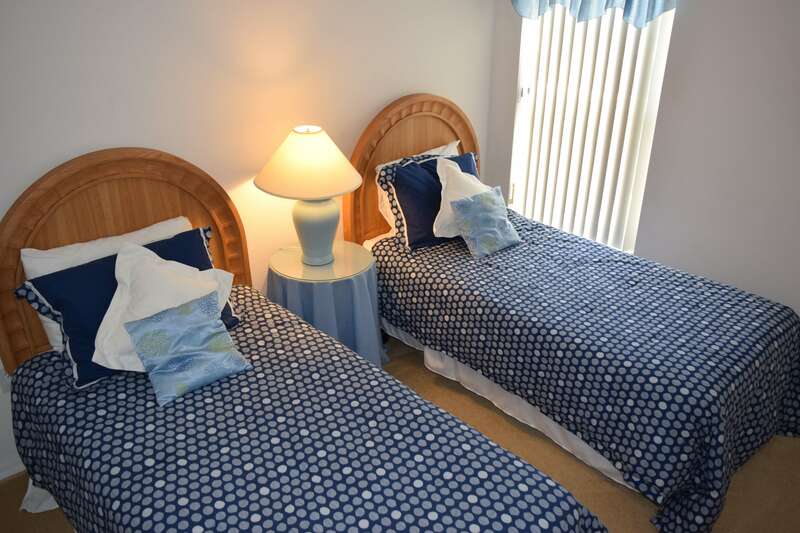 As an additional convenience, there is also access to the lanai area and pool deck from this delightful room. The huge Lounge Room, located at the front of the villa, is a perfect additional area in which to escape the exuberance of over excited children and indulge in a little grown up conversation. Whether it’s discussing your next day’s activities or using our complimentary internet access to surf the web, we guarantee that you will fully appreciate the comfort of our two matching sofas (one a sleeper sofa), the elegance of our wrought iron and glass topped furnishings and the extravagance of our overly large and impressive table lamps. As always, delicate window treatments and gorgeous decorative accents finish off this haven of relaxation to perfection. Often advertised for the benefit of the children in your party, experience has taught us that usually the parents sneak into the Games Room too, to try their luck against their younger siblings ! And who can blame them, when there’s a full size pool table with professional overhead lighting, challenging foosball and super fast air hockey on offer? Our top of the range equipment will provide hours of fun and laughter for the entire family. Game on! In addition to our fabulous Games Room, we are delighted to cater for our younger guests by providing a cot (crib), high chair, strollers, pool toys, books, DVD’s and a great selection of family board games. At the heart of The Willows is the magnificently appointed open plan kitchen. Featuring a large fridge freezer with ice maker, double oven, hob, microwave, slow cooker, dishwasher, waste disposal, coffee maker, toaster, electric can opener, cooking utensils, glassware, plates, knives, forks etc. and a portable stereo system, you’ll find absolutely everything you need to create a welcoming family meal. When it comes to dining locations, you really will be spoilt for choice. With a formal dining table seating six, the breakfast bar seating a cosy two, or the breakfast nook area seating a further four guests, you can dine wherever the spirit moves you! By now you will have realised that at The Willows, we don’t do things by half. So it will come as no surprise to hear that all of our bedrooms and bathrooms are stylish, practical and beautifully presented for your comfort and convenience. 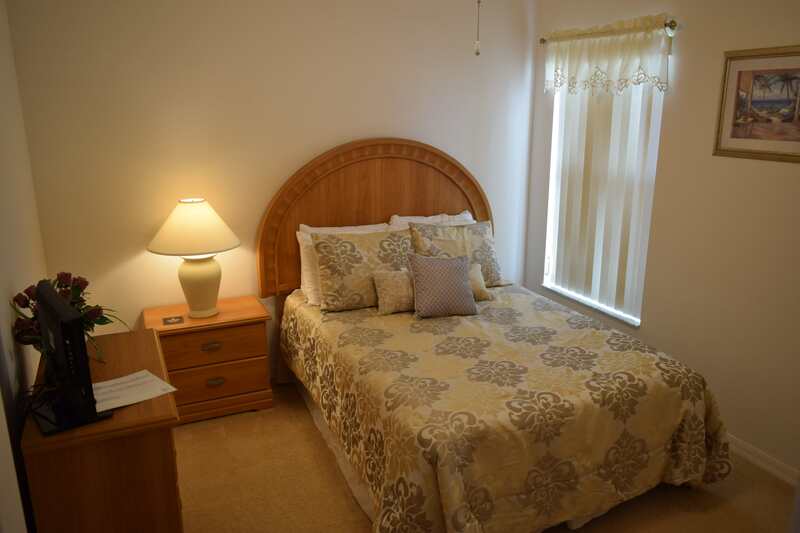 Bedroom 1 / Bathroom 1 – King size bed, matching night stands, bedside lamps, walk in closet, radio alarm clock, tasteful decorative accents and a cable TV. 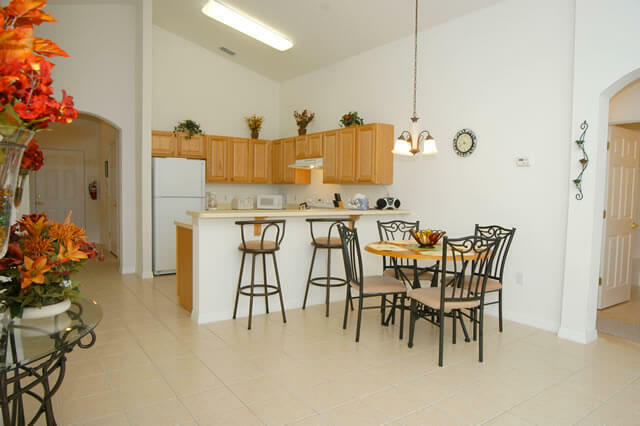 This spacious room also has the added benefit of affording direct access to the lanai and pool deck. 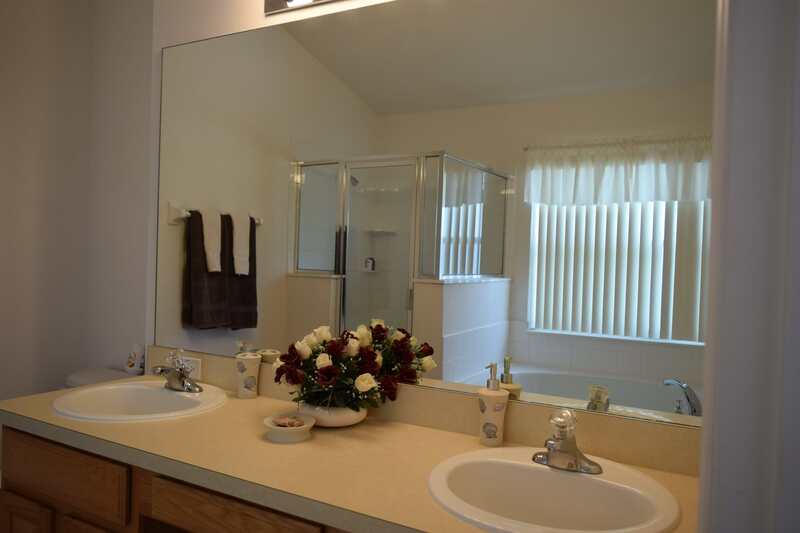 The fully equipped master en suite provides a large walk in shower, separate corner bath tub, w.c., hair dryer and his and hers double vanity. Bedroom 2 – Double (full) bed, built in closet, matching drawer unit and night stand with bedside lamp, clock radio and a cable TV. Our quality bed linens and the soft natural tones of the furnishings will guarantee a restful nights sleep. Bedroom 3 – Twin Bedded room featuring two full size single beds, built in closet, drawer unit, bedside table, bedside lamp, wall mounted mirror, charming window dressings, radio alarm clock and a cable TV. Dressed with soft pastel blue comforters, our beds will be a welcome retreat at the end of a busy day. 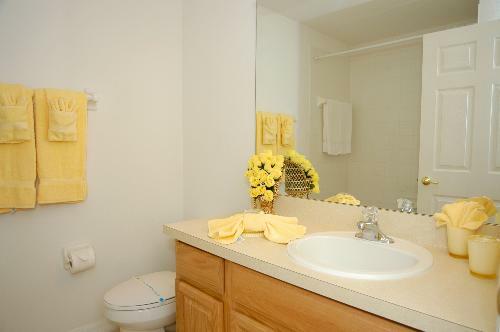 Bathroom 2 – Family Bathroom – Conveniently located between bedroom 2 & 3, this fully appointed bathroom benefits from a shower, separate bath tub, single vanity unit, w.c. and a hair dryer. Our separate Utility Room offers great practicality combined with ease of use by hosting a large washing machine, tumble dryer, iron, ironing board and vacuum cleaner. Thank You for your interest in The Willows. If we can be of any further assistance, or you wish to check our current availability, simply fill out the no obligation enquiry form below.